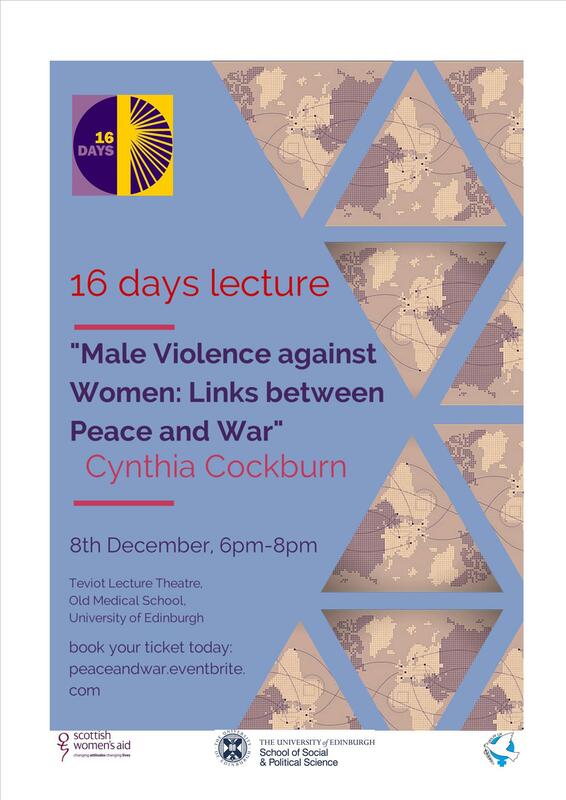 Scottish Women’s Aid, in association with Women’s International League for Peace and Freedom and the School of Political and Social Science at the University of Edinburgh, are pleased to invite you to our 16 days lecture, “Male Violence Against Women: Links between peace and war”. Renowned academic, Cynthia Cockburn is a visiting professor in the Department of Sociology at City University London and an honorary Professor in the Centre for the Study of Women and Gender, University of Warwick. She is involved in the international feminist antimilitarist networks Women in Black against War and the Women’s International League for Peace and Freedom. YES or NO, Trident still has to go – NOW! Following the result of the Scottish independence referendum we believe that the issue of Trident nuclear weapons in Scotland is still not settled. Section of the Scottish Wool Against Weapons Peace scarf at the North Gate Faslane Naval Base 20.09.14. Scrapping Trident was a central part of the Yes campaign, which attracted 45% of the vote, and a significant percentage of No voters also believe passionately that there is no place for Trident in Scotland. This means that a clear majority of the people in Scotland want to see Trident scrapped. The next intake of MPs to Westminster will be taking the decision in 2016 of whether to go ahead with replacing the current Trident system at a cost of £100 Billion. With spending on health, education, pensions and disability benefits being slashed we believe that squandering such a sum on nuclear weapons is immoral and unreasonable and call for Trident to be scrapped and human needs funded. 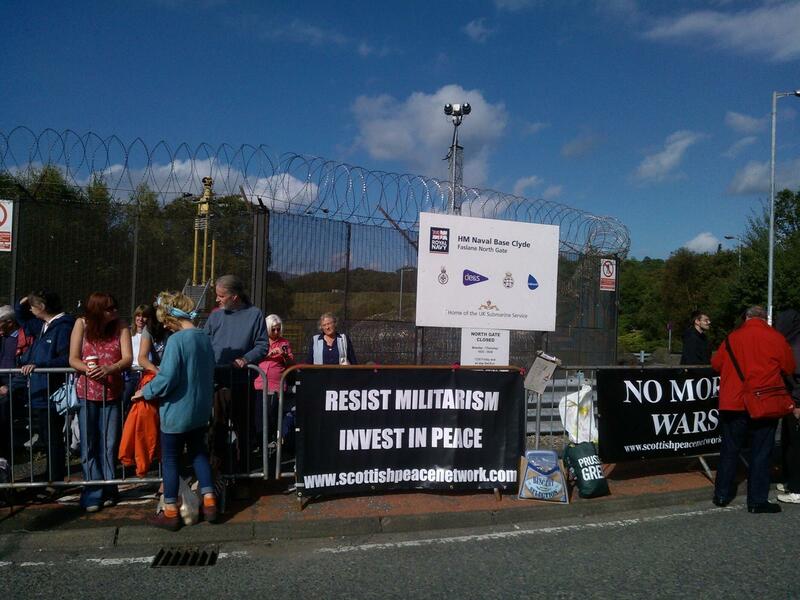 Scottish Network for Peace Banners at Faslane Nuclear Submarine base 20.09.2014.
particularly those people who have never attended a demonstration at Faslane before but feel that now is the time for them to make their voice heard. We want the people of Scotland to unite and to make a call for peace that will be clearly heard by all of the political parties, both in Holyrood and Westminster. Our message is clear – YES or NO, Trident still has to go – NOW! This year’s seminar is packed with fantastic sessions! Sexual violence in conflict: From global to local solutions includes a mock trial of UN resolution 1325, with the audience acting as the jury, a session on how the UN works for women and special reports on 1325 from Eritrean and Somalian women. There will be beauty and information stalls, and attendance certificates are available. Book by emailing office@ukwilpf.org.uk; calling 020 7250 1968; or online here. The full programme is available to download here. Stall in the Scottish Parliament to give out white poppies to MSPs, workers and guests. A joint event with ‘Forceswatch’ showing their new video . Monday 3rd November evening – time to be confirmed. We may know about sexual violence in the DRC, but do we understand how our own consumption of mobile phones, computers and cars fuels the conflict? This event will examine the trade in conflict minerals to manufacture Western consumer goods, and how we can we pressure for more effective regulation of “conflict minerals”. The movement for the Abolition of War is organising a Peace Conference on Saturday 11 October at the Imperial War Museum in London. There will be a musical addition to the programme, offering you a chance to hear a medley of the songs written or arranged specifically for the World War One centenary by songwriter Sue Gilmurray. A small choir will perform some of them with Sue during the lunch-break, and again at 5pm. Transport: The Museum is on Lambeth Road SE1 6HZ. The nearest tube station is Lambeth North (Bakerloo Line) but it is also close to Waterloo Station and Elephant and Castle. Buses that stop nearby include 159, 360, 109, and 344. Refreshments: Tea and coffee will be provided as part of your registration. There is a café at the Museum where you can buy lunch, but it does get very busy. You may prefer to go out, or bring your own sandwiches to eat in the ‘picnic room’ which will be available for conference participants. Registration fees:£15 early bird (book by 31st August) £20 standard; £5 full time student. If you have any questions before the conference please contact Hilary Evans on 020 8898 4850. Orpington WILPF invites you to a talk by MAYA ANNE EVANS of Voices for Creative Non-Violence UK at 7.30pm in The Church Parlour, Methodist Church, Petts Wood, Kent BR5 1EB (opposite Morrisons). Local bus 208, train from London Charing Cross to Petts Wood rail station. On 9 August 2014 the minibus holding Orpington WILPF branch, Bromley CND and others from further afield set off for the Rainbow AWE Burghfield milestone to join our part of a knitted/crocheted scarf to the many other pieces coming from all parts of the UK and beyond. The aim: to join the atomic nuclear weapons factories of Aldermaston and Burghfield with a pink seven-mile longscarf knitted and crocheted by people from all over the world. The weather was very kind to us and upon arrival we shortly found a stretch of road that needed a bit of scarf to join a gap. By 1.00pm word had been passed down the line that we had exceeded the 7-mile length objective and the scarf had joined the two weapons factories. As planned, at 1.00pm there was a reflective silence followed by bell ringing before we cut the stitches holding our length of scarf to others on either side and began to carry it back towards the Rainbow AWE Burghfield milestone. 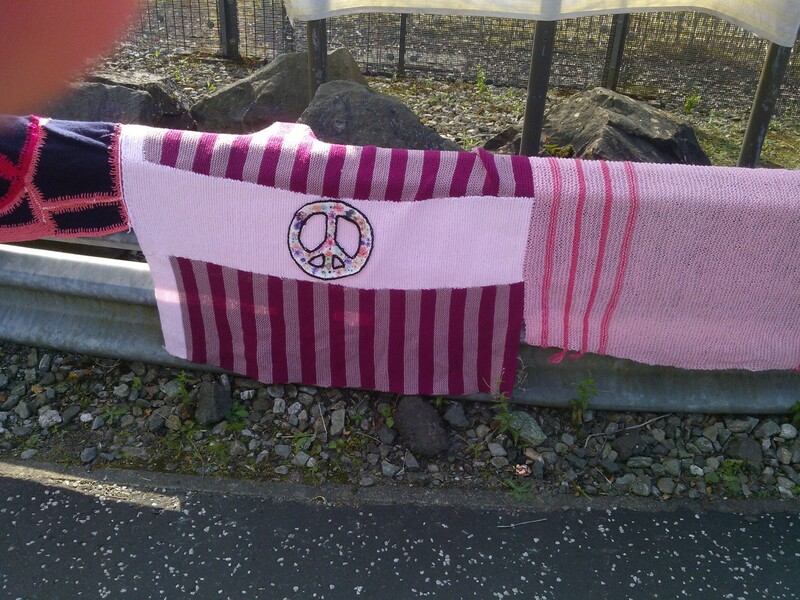 Along the way we noticed a WaW/CND pinwheel awaiting collection, so we rolled up our own piece to lay it by its side. A pinwheel is 40 metres of scarf rolled up – just enough for one person to carry. 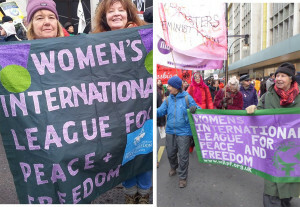 We were not the only WILPF group at this national event; Brighton Branch were at the opposite end of the scarf at Rainbow AWE Aldermaston milestone and our fellow WILPFers from Norwich passed by our spot and stopped for a chat and photos. Brighton branch commemorated the 1945 atomic bombing of Hioroshima with a ceremony at dusk on 6 August 2014 in Queen’s Park, Brighton. It was well attended and WILPF member Jennifer Korty spoke about American reactions and their thinking about that bombing, which was very interesting. A poem was read and there was a silent, reflective walk around the park lake in before placing lighted candles around the Peace Tree. In 1914, within an hour of the delivery of the Kingsway Hall resolutions to Downing Street, Britain’s ultimatum to Germany expired and the countries were at war. WILPF UK re-enacted the rally from 11 am to 12 pm on 4 August 2014, near Holborn underground station, and then delivered a letter to 10 Downing Street requesting meetings with ministers to discuss peaceful solutions to the world’s conflicts. You can read our press release and media coverage of the event. Cornwall Group commemorated the outbreak of WW1 by highlighting the Women’s Rally that took place at the Kingsway Hall, London in 1914. A vigil was held at lunch time under a banner that stated ‘4th August the Slaughter Began, Stop War, Challenge Militarism’. We handed out all the copies of letter created for the day by exec members, the conscientious objectors booklet and lots of other relevant leaflets such as the No Nukes, Drones. We spoke with dozens of people throughout the event and received much support. This year our speaker is Rebecca Johnson, Vice President of CND & Co-Chair of ICAN (International Campaign to Abolish Nuclear Weapons) who will be talking on ‘Women, Wool and Trident: Urgent Action for Peace and Disarmament”. Opening at 2.30pm we have stalls, raffles and a delicious tea, with all proceeds going to support the work of WILPF. WILPF Brighton’s annual Garden Party will run from 12.30-3.00pm. A fun, free day out for the entire family, with live music, a dog show, stalls of all kinds, a cake competition, bbq and creative workshops. We look forward to seeing you there! Brighton branch are hosting readings from WILPF’s pamphlet ‘Opposing World War One: Courage and Conscience’ and poetry from the First World War at the Friends Meeting House, Ship Street, Brighton.